With quite a large girth (about 10 millimetres in diameter), the Merlin Chopin clearly offers quite a lot of materials for the money. It even includes what appears to be a ferrite noise-absorber (Merlin is cagey about this), which ought to improve rejection of interference. Ferrites are sniffed at in some quarters and while they certainly don't fix every kind of interference problem I've never been able to persuade myself, theoretically or subjectively, that they have any bad effects on audio. Beneath that, the cable is apparently made up of six conductors twisted together to give good rejection of lower-frequency interference, including hum. There's a foil shield as well and the outer casing is a dense fabric braid. The phono plugs are decent quality, if not amazing and on the review sample, at least, were not locking types, despite claims on the Merlin website to the contrary. 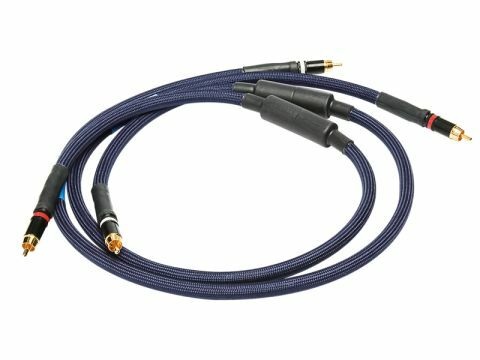 It's all too easy to put a fat cable into a system and expect to hear a fat bass, but in fact the character seems, if anything, to be the other way – fast and agile but with a slightly bass-light quality. Don't stop reading just yet, though, for at the same time the bass is exceptionally well detailed and actually very tuneful too, it just doesn't have quite the reach of some. As a result, low frequencies are very communicative. That trend is continued up the band (through both midrange and treble) and although this probably isn't the most analytical cable in the top few octaves, it does have a very persuasive way with almost any kind of music.